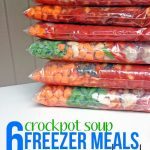 Eight crockpot freezer meals. 35 minutes. $60. Wahoo! Here’s how I made it happen, including my recipes and grocery list. 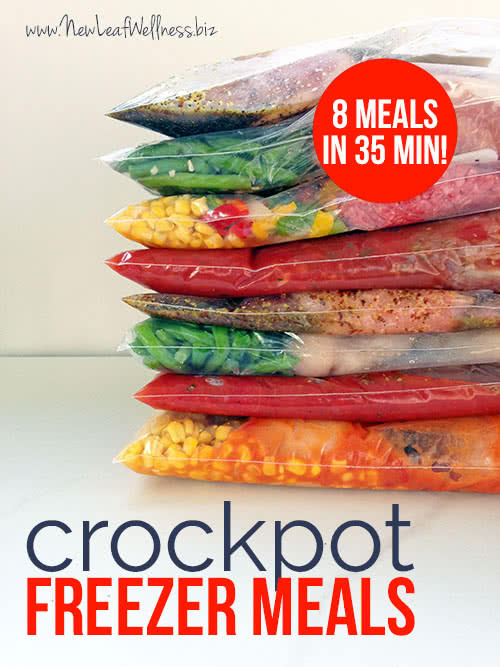 Normally, I double my crockpot freezer meals and make two of each at a time. This strategy saves me a ton of time and money. 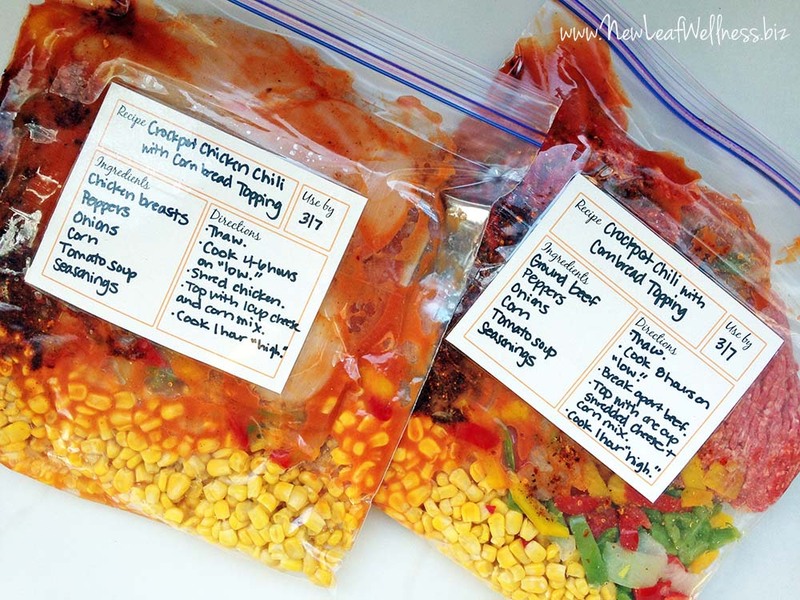 I can buy the ingredients in bulk and use the same ingredient measurements for two freezer bags at a time. Since freezer meals last at least three months in the freezer, we have no problem eating the same meal twice. In fact, we don’t mind eating the same meal every 3-4 weeks. The more freezer meals I make, the smarter I get though. Last week, a light bulb went off and I decided to focus on my favorite recipes that work with different types of meat. (For example, my favorite chili recipe that tastes good with chicken and beef.). That way I could still save time and money, but make different meals in the process. 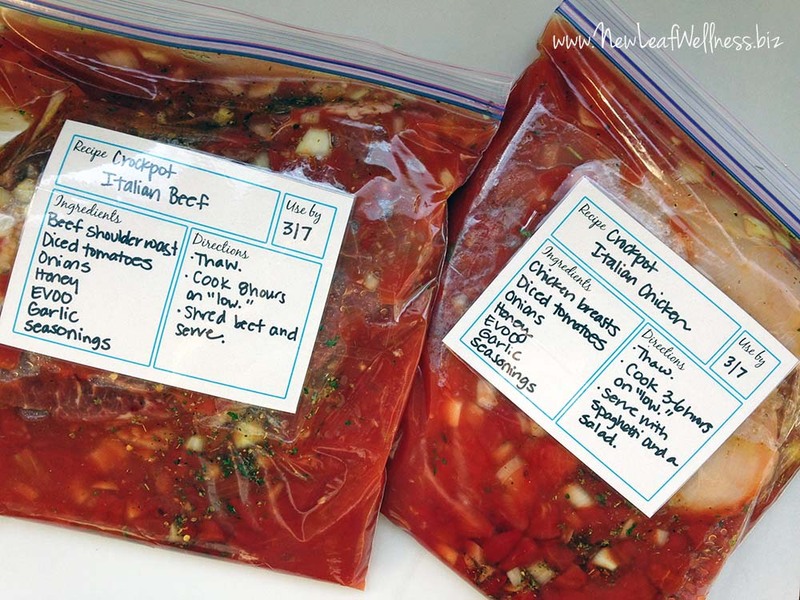 I added all of the ingredients raw to gallon-sized plastic freezer bags and froze them. It only took me 35 minutes to assemble them, and now we’re set with eight meals for busy weeknights. Yay! I’m planning to serve them with simple side dishes, like steamed broccoli, microwave rice, and salads, so dinnertime will be a breeze. 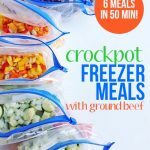 I’m really excited about these freezer crockpot recipes because I think they would taste great with any meat. You can make them with whatever kind of meat your family prefers or whatever is on sale at the grocery store. 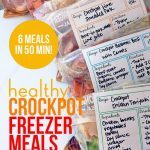 The last time that I prepped eight healthy crockpot freezer meals, it took me 75 minutes to make them, so I was SHOCKED that I was able to finish in 35 minutes this time (including clean-up!). I think these meals took less time because I wrote out my freezer meal labels ahead of time and used frozen vegetables instead of fresh. 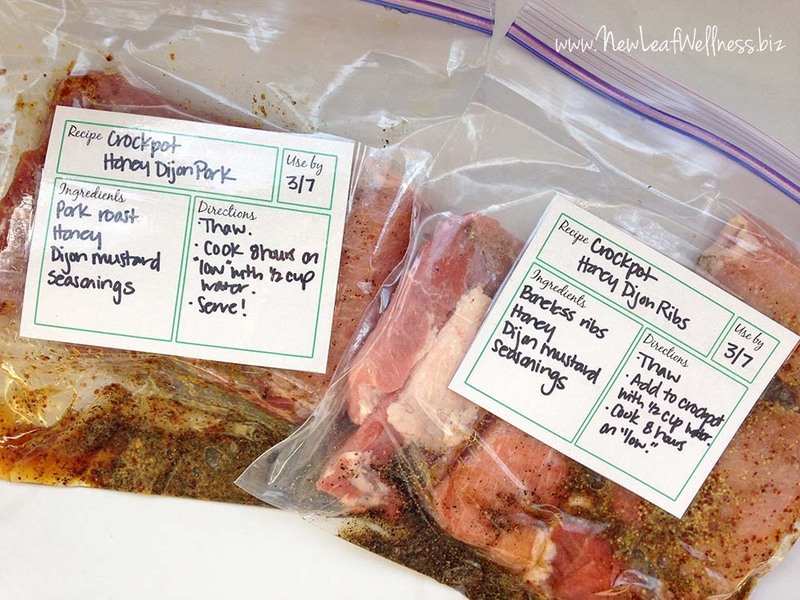 I also used homemade spice mixes that I already had on-hand. 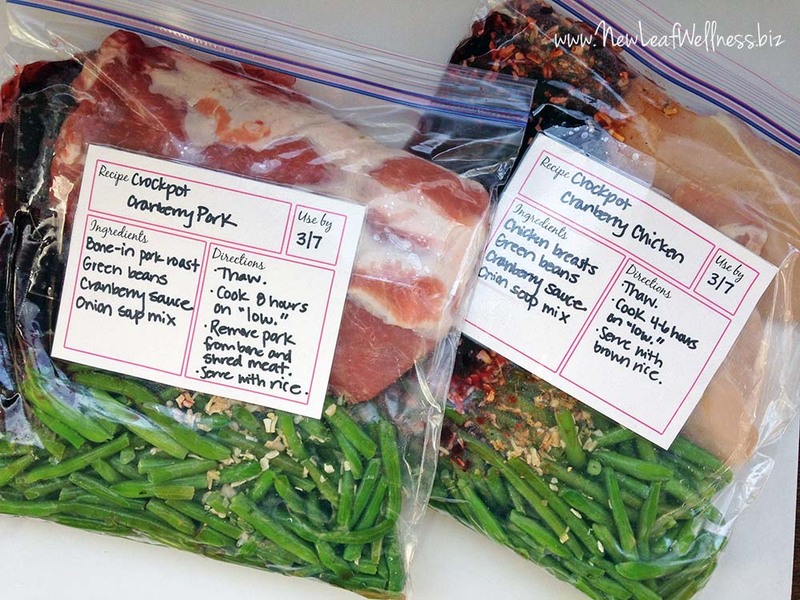 If you’ve never made freezer meals before, the grocery list and recipes above with walk you through the process step-by-step. It’s so easy – I promise! 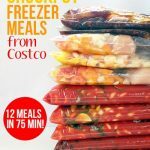 You can also check out my $5 freezer meal blog post and my No Cook Freezer Meals cookbook for more info. Thoughts or questions? Leave a comment below. I’d love to hear from you. I’d love to see more recipes without sweeteners/sugars (sugar, honey, high fructose corn syrup, fructose, etc) Cranberry sauce is loaded with sugar. Sugars increase the risk for diabetes, high triglycerides, & being over weight. I’m going to figure out if I can do the chicken cranberry version with real frozen cranberries! I think I’ll make a batch of cranberry sauce with honey and then put it with the chicken in the baggie when it cools and see how that goes. The other thing that I have the urge to add (must have tried this at a previous time) is dijon mustard. It mixes nicely with cranberries and adds a tang. Thanks so much for sharing. I’d love to know how the real cranberries work out. I’d love to try making it that way someday. I just found your website and can’t wait to try your recipes. I too would like recipes without added sweeteners. Yes, there are the health issues related to sugars, but I just prefer main dishes that don’t taste sweet. If these are recipes you like, then great! If you are looking for something else, then move along, citizen. You need not post a note telling us all how smart and superior you are for knowing about sugar. We all know. I feel you Jamie! I’m in the same boat, and those comments are annoying AF! Diagnosed at 1 year old. So sick of people throwing around the word diabetes like they know something. Obviously they are talking about type 2 (which even then isn’t cool to disease shame…) but it’s annoying. Get out of here with those comments! You can make those changes yourself; and there are plenty of recipes without those additions on this site. Thanks for some great ideas!! Genetics cause diabetes as well as being overweight and having the lack of physical activity. Eating sugar is not directly linked to causing diabetes. It is a indirect link: a chain reaction if you will: eating a lot of sugar, turns into fat, which in turn if you are not physical active or eat a lot of junk will cause you to gain weight. End result the possibility of being diabetic. There is a misconception that sugar is the cause of diabetes. I don’t believe the original poster said anything about having diabetes. She requested more recipes without sugars/sweetners. Great ideas and so time saving. How do the green beans come out after being in a crockpot for so long in the cranberry chicken recipe? We think they’re delicious! I definitely recommend using frozen or fresh green beans over canned though. I might just be missing it, but I can’t find the amounts. How much EVOO and honey and other stuff goes in each meal? Awesome idea, I can’t wait to try it! Where did you get the labels?